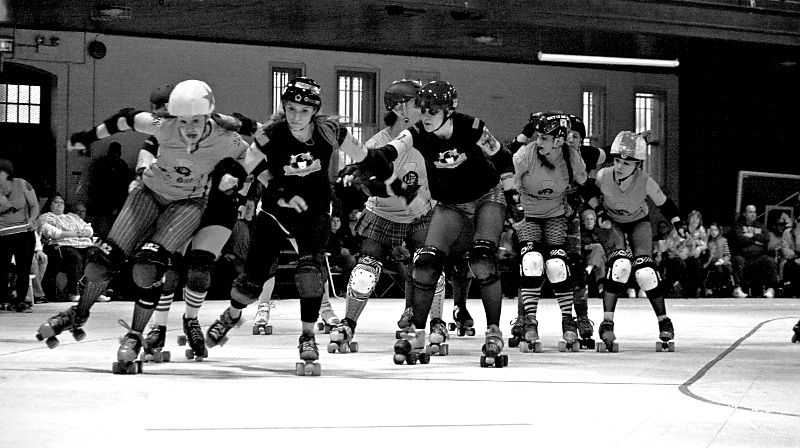 OSWEGO — While Oswego and Plattsburgh have a storied hockey rivalry, roller derby leagues from the two cities will meet for the first time when the Oz Roller Girls host the North Country Lumber Jills on June 2. Doors will open at 5 p.m. for the zombie-themed Dawn of the Derby bout. Action begins at 6 p.m.
Oz comes in with a 3-1 record after rallying to defeat the Albany All-Stars A Team 219-173 earlier this month. The Lumber Jills, who like Oz first organized in 2010, beat the Derailing Darlings of Oneonta 196-30 in their last contest. The leagues hope the matchup can capture some of the energy of the Oswego-Plattsburgh men’s college hockey rivalry. The two hockey teams are perennial NCAA playoff contenders, have met nine times in the past dozen years in the SUNYAC championship game and their high-energy rivalry earned a No. 92 spot on the Madtown Badgers Top 100 College Sports Bucket List. As an additional attraction, zombie enthusiasts are encouraged to participate in a costume contest. A portion of the proceeds will support the Oswego YMCA. An after-party at Greene’s Ale House, 104 West Bridge St. in Oswego, invites fans to congratulate and meet both teams. Tickets cost $15 for trackside VIP, $10 for general admission, $5 for children 4 to 12 with kids 3 and under admitted free. For more information, visit www.facebook.com/ozrollergirls.